MADISON, Wis. — Racine Mayor Cory Mason and city officials coordinated with the school district and the local teachers union on what critics say is a misinformation campaign about the Racine Parental Choice Program, according to internal emails obtained by the MacIver Institute. The communications expose how integrally involved in the campaign Racine Educators United was, calling meetings with city officials and calling some of the shots on the information literature. In fact, the actual property tax levy for parental choice private schools is 5 percent, when calculating the millions of dollars more the district receives in general school aids — thanks to the school choice program. A Racine Unified School District official, when told of the communications, said she was “unaware of the intricacies of the back and forth” communications involved. 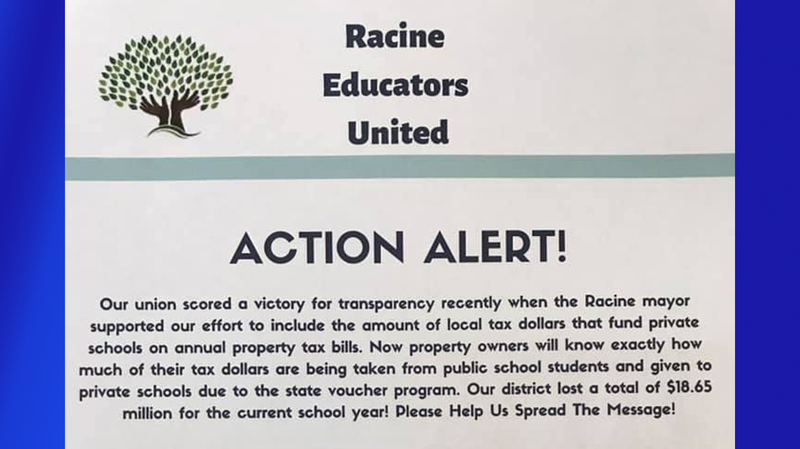 In its latest round of property tax bills to homeowners, the city of Racine included an insert claiming that one-fifth of Racine’s property tax levy goes to private voucher schools in the school district. The point of the insert: Let Racine property taxpayers know just how much money the school choice program is siphoning from the public education system. Except, the accusation is spurious. The message is, at best, misleading, dismissing some important facts, as Ola Lisowski reported in a MacIver Institute analysis on Tuesday. In fact, the actual property tax levy for parental choice private schools is 5 percent, when calculating the millions of dollars more the district receives in general school aids — thanks to the school choice program. By law, the state must hold traditional public schools harmless from the financial impacts of students leaving their systems and moving into choice schools. There is no robbing Peter to pay Judas, as the public school industry would like property owners to believe. And from the beginning, Racine Educators United, a coalition of the Racine Education Association and the Racine Educational Assistants Association and vocal opponent of Racine’s non-union voucher system, was leading the charge on the tax insert campaign. The teachers union was joined at the hip with a dear, old friend to Big Labor, and a dearer old enemy of the parental school choice system: Mayor Cory Mason. In an email on Aug. 17, 2018, Angelina Cruz, president of Racine Educators United, contacted Shannon Powell, the mayor’s communications director, looking to set up a meeting on a “voucher transparency petition.” She did so on her Gmail account. Powell takes it from there, organizing a meeting to discuss the creation of a voucher tax insert. Cruz is invited, so is Mason, and Kathleen Fischer, the city’s assistant finance director. Fischer was looped in on the front end because her office “produces and sends out the bills,” Powell wrote. Powell reached out to Racine Unified School District CFO Marc Duff in a Nov. 16 email seeking information on the levy for vouchers and special needs vouchers. “I am also trying to figure out if it is possible to somehow just account for the City of Racine’s portion of that. Maybe there isn’t a way to do that, but I would be interested in hearing your thoughts. But the answer to the question will inform the way I design the insert,” Powell wrote. As the pace and urgency of the voucher impact campaign intensified, Powell contacted Fischer about the status of production. He did so using his wife Chelsea’s email account. Chelsea Powell, it appears, did much of the design work on the insert. “We changed the numbers per your instructions and the school districts [sic]. We also added the word ‘private’ where requested by the school district to create the ‘private voucher’ language — it’s a good change,” Powell wrote in the email, sent on the evening of Nov. 27. The city officials at one point sound a bit cranky about the mayor’s constant tinkering with the insert. “State law compels the RUSD Board of Education to levy a tax for both RUSD and private voucher schools …,” the insert states. “Unfortunately, when people haven’t been able to win an argument they try to use misleading facts to try to lead people to an answer they want them to have,” said Assembly Speaker Robin Vos. School choice proponents say Racine’s voucher impact insert is replete with misleading information and half-truths. “Unfortunately, when people haven’t been able to win an argument they try to use misleading facts to try to lead people to an answer they want them to have,” Assembly Speaker Robin Vos (R-Rochester) said Tuesday during a Capitol press conference. Vos wrote a scathing criticism of Racine city officials in the Racine Journal Times. The insert is inaccurate because, parental choice advocates and budget analysts agree, it leaves out the impact of equalization. Duff, Racine Unified’s finance director, stands by the numbers he provided to the city, although he insists the school district did not lead the campaign. He pointed to a Legislative Fiscal Bureau memo on voucher aid education “used by others to quantify or validate the voucher tax impact.” He noted RUSD’s final revenue limit for 2018-19. Jim Bender, president of School Choice Wisconsin, says Duff got it half right. What Duff fails to include, Bender said, is the $13 million-plus that goes back into Racine Unified’s aid coffers thanks to voucher students, as another Legislative Fiscal Bureau memo notes. So the impact, Bender said, isn’t 20 percent, it’s closer to 5 percent, or about $4.8 million. Even the lower figure doesn’t quite hit it in Wisconsin’s complicated school funding system. Unlike the characterization in the property tax insert, the state does not “compel” the Racine Unified School District’s Board of Education to levy a tax; it allows them to. And, unlike the characterization in the property tax insert, the state does not “compel” the Racine Unified School District’s Board of Education to levy a tax; it allows them to. And there certainly is no mandate on taxing to the max under revenue limits, as Racine Unified did. There seemed to be some disagreement on this topic between the producers of the voucher impact insert. Mason, too, stood by the disputed property tax figures. “The numbers used by the City of Racine for the property tax impact were generated by the Racine Unified School District, verified by the state Department of Public Instruction …” Mason said in an email, through Powell, to MacIver News Service. He pointed to the same Fiscal Bureau memo that Duff did. 1. How much did the city (its taxpayers, really) pay for the production and distribution of the inserts? 2. Is the mayor concerned about the apparent conflict of interest in the city allowing the teachers union to not only be involved in the process, but to control it, or at least a portion of it? 3. Some of the communications were on Gmail accounts. This would seem to be counter to Wisconsin’s open records law on communications related to government business. Do you have a comment? 4. Does the mayor feel the school choice program in Racine should be eliminated? Mason is no stranger to allowing public sector unions call the shots. As MacIver News Service reported last month, Mason, as a Racine state representative in 2009, allowed unions to help craft the final language of his draft bill mandating environmentally friendly cleaning products be sold in schools and government buildings. The bill’s ghostwriter was Democrat Party heavyweight Jeff Neubauer, husband of liberal state Supreme Court candidate Lisa Neubauer and owner of a janitorial supplies company that would have benefitted from the legislation. Guess who’s name shows up in at least one of the emails: Jeff Neubauer. It turns out Racine Unified paid north of $23,000 for a poll on education, and the well-connected Neubauer was in on the conversation, according to documents obtained through an open records request. Gov. Tony Evers, a Democrat, has proposed freezing the popular parental choice program. And Evers, the former superintendent of the Department of Public Instruction, would expand Racine’s so-called “transparency” initiative. Vos said Republicans won’t let the governor destroy school choice. “That’s why we have to set the record straight,” the speaker said. “I hope the city of Racine will rethink their use of taxpayer dollars to have a political agenda, but with what Gov. Evers is proposing I don’t have a whole lot of hope that we’ll be able to stop it.